Low, flat-rate tuition and financial aid make your degree attainable. 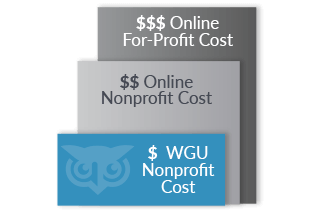 WGU is committed to keeping tuition low—in fact, we're about half the cost of most other online universities. Our priority is to help you graduate with less student debt—or none at all. WGU charges tuition at a flat rate every term. The more courses you complete each term, the more affordable your degree program becomes. Provide useful information and advice on responsible borrowing. Offer degree programs that lead to better-paying jobs after graduation. Since the launch of WGU's Responsible Borrowing Initiative in 2013, the average borrowing of students who take loans has decreased by more than 40% Undergraduate students at WGU graduate with half the debt of their peers across the country, and the university's three-year loan default rate is also less than half the national average. 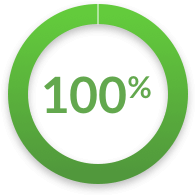 Our commitment is to empower you to finance your education responsibly. Learn more about our Responsible Borrowing Initiative. A WGU degree delivers superior results—it means you’ve demonstrated mastery of real-world competencies that employers are looking for. As a result, WGU grads frequently get jobs that more than pay for their education in a short amount of time. In a 2018 Harris Poll Online survey, recent WGU grads reported earning, on average, $12,600 a year more within two years of graduation, compared with income prior to enrollment. By four years after graduation, that income increase averaged $18,400, compared with the national average of $12,400. With an average cost of $16,500 for a bachelor’s degree, most WGU graduates see a positive return on their investment within 2 to 3 years. Top military-friendly school 10 years running. WGU is proud to offer a flexible, affordable education that fits the needs of America’s service members, veterans, and their families. Your WGU online degree program will travel with you no matter where you’re deployed or stationed. Our programs are approved for benefits under the Montgomery GI Bill®, and because our tuition and fees are so low, veterans will usually find all of their costs covered by their government benefits. WGU has been named a top military-friendly university for 10 consecutive years by Military Advanced Education Magazine and for five straight years by G.I. Jobs Magazine. Learn more about VA and military assistance at WGU.